Social networks are groups of people who are linked by some type of connection. New friends come into the mix. Friends come into the mix, and eventually you have a network of people who may not know each other in the real world but are connected on the Internet. The phenomenon part of the social network is how quickly people have adopted it. 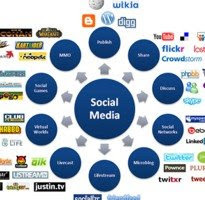 And using the connections made available by social networking, the category of social media has grown nearly as quickly. a. Wikis, these are collaborative web sites. The concept behind wikis is that anyone who has access to the site is able to add to or change any page on the site. Example : Wikipedia. b. Social networks, A group of people tied together by some common interest. Interests can range from reading to education to food to news or any other subject imaginable. Example : Facebook, Myspace, Villij. c. Presence applications, Present application are like miniature blogs. These sites allow users to communicate back and forth using their services. Conversations run from important to completely mundane on these web sites. Example : Twitter, Jaiku, Pownce. d. Video sharing, Have a great vacation video you want to share? YouTube takes “America’s Funniest Home Videos” to a whole new level. If you have a digital video camera and some time, you can create and share any kind of video that you would like. Example : YouTube. e. Virtual reality, This interesting social networking category is like living in a fantasy world. You make up your looks, personality, your life, and all of your surroundings. But don’t think this is just a game. Living a virtual life can be more than just fun; it can also be a way to make a good income for some people. Example : second life. f. Events, Events networks connect people according to the events that they are attending or want to attend. If you want to know who’s going to be at that TobyMac concert on Thursday night, check out on of the social-events networks. Example : Upcoming. g. News aggregation, These social networks are connected by current and past news. If you find a news story that you think is good enough to be shared with people whose interests are the same as yours, you can add it to your network for them to view. Example : Digg, Reddit. i. Livecasting, Livecasting is literally live webcasting. A community is built around the webcasts, including everything from blogs to chatrooms. Example : Justin.tv. j. Media sharing, If you want to create a network of people with whom you can share all kinds of media files, these services are the ones to use. Connect to as many or as few friends as you like when sending e-mails, videos, audio files, and more. Example : Izimi, Twango. l. Social Social bookmarking is one of the most widely used social-media techniques bookmarking These services allow you to tag news stories, blogs, videos, audio files, web sites, and other Internet-based services to share with friends. Tagged sites are then ranked (and searchable) according to the number of tags received. Example : del.icio.us, ma.gnolia.com, blinklist.m. Social network, Social networks have gotten so pervasive that much like metasearch aggregators engines, social network aggregators have begun to arise. The concept is to log in to one place and see all your updates from various social networks, photo sharing, and presence applications. Example : Socialthing! Socialstream, Profilactic.